When it comes to achieving the impossible, true determination to ace your goal is the sole requirement and Mary Kom is living proof of the same. Her passion for boxing was once again seen when the five-time world champion lost 2kg in just 4 hours right before she was to participate in the just-concluded Silesian Open Boxing Tournament – where she picked up her third gold of the year. “Thankfully, the flight we traveled in was nearly empty so I could sleep with my legs outstretched, ensuring that I was not stiff on landing there. Otherwise, I don’t know how I would have been able to compete,” she added. 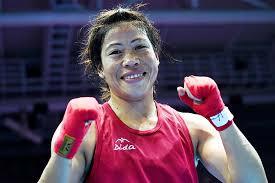 She was the only boxer from India to win the gold at the tournament in Poland. “I am never satisfied with how I perform, I am always looking to work out new strategies. I am obsessive but not overtly aggressive. I like to conserve in about. I always like to study my opponents and then dismantle them bit by bit,” she said. “She cannot sit idle even after coming from a long journey. Something is dusty, it needs to be cleaned right away, she does it herself, or else she would find something in kitchen. She gets her happiness in all this, that’s how she unwinds,” said Onler.